Mrs. Nadine Templer our Executive Officer – Educational Program, visits the school often to inspire and motivate both students and teachers. She is a great asset for the Schools in India. 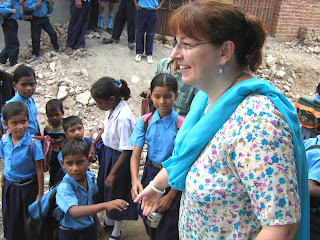 Her vast experiences as a teacher, her inspiration and motivation have helped the educational programs in a great way. She loves children very much and has a big heart for the underprivileged children. Couple of photos taken on her most recent visit.